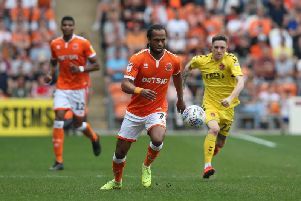 Blackpool’s Nya Kirby is hoping his first senior goal will result in more game time before the season ends. The 19-year-old found the net for the first time as a professional in Saturday’s thrilling 2-2 draw away to League One leaders Luton Town. It was only the midfielder’s second start for the Seasiders since his loan move from Crystal Palace in January. And the England Under-17 World Cup winner, who has made seven Pool appearances in total, hopes for more action in the final five games of the season. Kirby said: “I only found out I was starting just before the game. “The family were here. I’m a London boy, so quite a few of them came. “It’s been frustrating (not to play more) but it’s good that I’ve now got my shot, got my start and hopefully I’ve shown enough to start the next game. “It’s down to the manager but hopefully I can start again. Starting every game has been my aim since I’ve come here but it’s taken longer than I had hoped. “But I got another start and hopefully I’ve solidified my place in the team. Kirby netted his first senior goal in impressive fashion, slamming home an exquisite volley from the edge of the box to make it 1-1. “It was a big moment for me and it’s one I’ve been looking for,” he added, “especially playing for a team like Blackpool. Matty (Virtue, his fellow scorer) did well to get it down and it popped up nicely. I kept my eyes on it and had a good strike, and luckily it went in. The Seasiders were denied a shock win when Jason Cummings equalised for the 10-man Hatters four minutes from time and kept their 28-game unbeaten run intact. “It was an exciting game,” Kirby said. “I’m disappointed we didn’t get the three points but it’s always good to get a point away from home. “They started well, which is how it goes sometimes. You’ve just got to stay patient and we had to keep our shape. “It was tough. Even after their red card they still put us under pressure, so it was a bit difficult but I’m pleased with the team.